The March 29 deadline imposed by the NY Court of Appeals on Argentina is fast approaching. On that date Argentina is expected to propose an alternative ‘pro rata’ payment formula for paying holdout creditors. For bond markets, a lot is riding on that filing even before the Court’s denial of Argentina’s petition for ‘en banc’ rehearing was issued yesterday (see: Argentina: The denial of ‘en banc’ rehearing raises the stakes of Argentina’s March 29 filing). In this note we focus on the possible implications of Argentina’s proposal of a ‘pro rata’ formula—the first issue on remand by the Court of Appeals. We refrain from revisiting the second issue on remand (i.e. whether financial intermediaries like BoNY will be constrained by Court orders). Sufficient is to say that, while acknowledging that the latter is not a settled matter yet, we expect that BoNY will not be spared from the Court orders (see Argentina: NY Court ready to slam the door of the US payment system shut in Argentina’s face, Feb 28). We have been concerned that if Argentina does not deliver enough flexibility (in NPV terms) the Court will be inclined to rule against Argentina. 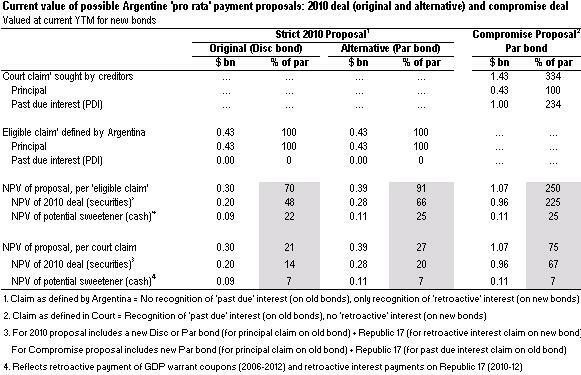 The analysis below suggest that despite variations around the 2010 proposal that can be used to «sweeten» the it, the NPV of most ‘pro rata’ payment formulas proposed by Argentina will inevitably represent a confrontational strategy rather than a compromise strategy. But we are watchful, particularly given an article in the local press this morning suggesting a possible package that might be considered a game changer (although the devil is in the details) and, if so, may offer the ‘silver lining’ in Argentina’s ‘pari passu’ saga. See below. The package described in today’s local press: a potential game-changer? In contrast, to packages that are limited to ‘sweetening’ the 2010 deal, any proposal from Argentina that fully recognizes PDI—and hence, deviates substantially from the 2010 offer—can shift expectations in favor of a potential ‘compromise’ that materially diminishes risks of future technical default. We lay out a simple (theoretical) example of such a proposal consisting of a Par bond payment for full claims and show that the NPV is attractive to holdouts- and hence, to the Court. In addition, we note an article in today’s Ambito Financiero suggests a different package (a Par bond for principal claims and a Discount bond for PDI claims) that might be presented and – while not as attractive as the one above – may be valuable enough to fall into the category of ‘compromise’. We incorporate this package into the analysis below. Of course, we cannot anticipate whether this article adequately characterizes the proposal that Argentina will present on March 29– but if it does, we point out that its NPV is potentially attractive for holdouts. This is because the package described in the article would imply recognition of past due interest (PDI) – and this implies a significant deviation from the 2010 debt restructuring terms. While Courts have said that «we are here to enforce contracts, not rewrite them» we believe that holdouts have an interest in signaling their interest or lack thereof in any proposal Argentina makes. And if, despite a rewriting of contracts by Argentina, the NPV is attractive to plaintiffs we find it hard to believe that the Court would ignore the latter’s opinion. Is Argentina really ready to ‘blink’ in the game of chicken and, hence, will President Kirchner betray her promise to not pay holdouts more than restructured bondholders? Ambito’s article implies that this may be the case. We will have to wait until March 29 for certainty regarding Argentina’s offer. But we want to highlight that this bit of local press information provides an interesting option to watch out for on March 29. A ‘confrontational’ strategy: This would be the case if Argentina stands by its promise to deliver a proposal along the lines of the 2010 restructuring (or one of several possible variations around it). In this scenario the NPV of the proposal (even if enhanced beyond the 2010 offer) falls significantly short of the value of the plaintiffs’ Court claims. This implies Argentina is seeking an unprecedented sovereign ‘cram down’ from the Court. Market uncertainty regarding the likelihood of that occurring will linger until the Court effectively delivers a ruling. But bond prices are likely to slip if the proposal falls into this category given the heightened risk of technical default that such a strategy entails if it fails. A ‘compromising’ strategy: This would the case if instead, Argentina surprises with a (significantly) better than expected proposal—and one that offers an NPV that approximates the value of the plaintiffs’ Court claims. Here again, market uncertainty will linger given the Court ruling remains pending. But bond prices may rise given the risk that holdout creditors might respond by signaling to the Court their willingness to embrace this offer. That signal can go a long way to deterring the Court from imposing one of two uncomfortable extremes: a ‘cram down’ (favorable to Argentina) or a strict contractual interpretation (favorable to holdouts). Until today’s Ambito article we were expecting that Argentina’s filing would represent a ‘confrontational’ strategy. President Kirchner has stated that proposing anything better than the 2010 deal would be «illegal, not economically feasible, and unfair.» And the Minister of Economy has stated that the strategy involves «convincing the judges, not the holdouts»—suggesting the NPV enhancements that might be hung on the 2010 proposal are unlikely to go as far as tempting holdouts to voluntarily embrace it. In this brief we provide investors guidelines to compare the value of potential proposals that Argentina may offer the Court. While expecting Argentina to adhere to the broad guidelines of the 2010 offer, we allow room for variations in the offer that can enhance its value. One variation of this sort would be to offer a Par bond instead of a Discount bond. Other sweeteners include recognizing retroactive payments on GDP warrants and/or retroactive interest on Republic 17s. We note that the net present values (NPVs) of all these alternative proposals fall visibly short of the value of court claims currently held by holdouts. This is true even when the variations around the 2010 proposal are valued at a (lower) YTM than that which prevails on Argentina’s restructured bonds today. Thus, we believe that all of these possible packages will be viewed by the holdouts and the Court as representing a ‘confrontational’ strategy by Argentina in pursuit of a ‘cram down’ ruling. In our view, the potential «swing factor» that could signal a ‘compromising’ strategy acceptable to the Court would involve commitment to more favorable treatment of past due interest (PDI) on old bonds than in 2010 (see Argentina: The (improbable) «smoke screens» Kirchner needs to deploy to obtain a surprise sovereign «cram down», March 3). This involves a substantial (and hence, politically risky) deviation from the 2010 deal which we do not anticipate Argentina proposing. However, if Argentina were to consider ‘blinking’ first (rather than waiting for the Court to do so) we would look for that signal in its proposed treatment of PDI claims. Recall that the 2005 and 2010 deals recognized principal but not the PDI claims. The par claims tendered by investors in 2010 were slightly above the 100% principal claim (claim ratios varied widely from 10% to 135% but the extremes reflected coupon strips—at the low end—and capitalizing bonds—at the high end). In contrast, currently, the share of holdout creditor Court claims represented by PDI claims far exceeds the principal claims. 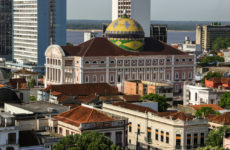 The Exchange Bondholder Group (EBG) filings suggest that the plaintiffs’ $1.43 billion claim against Argentina involves a principal claim of only $428 million. If so, this implies that plaintiffs’ par claim today stands at 334% (composed of 100% principal + 234% ‘past due’ interest)—far above the ‘eligible claims’ (as unilaterally defined by Argentina in both its 2005 and 2010 tender offers). The difference between the ‘eligible claim’ ratio (near 100%) of the 2010 offer and plaintiff’s (334%) contractual claim is enormous. Thus, PDI recognition is the single most important factor which can be adjusted in order to approximate the NPV of the 2010 proposal to the value of Court claims and determine a compromise. Valuing Argentina’s ‘pro rata’ proposal of March 29 in order to determine whether it reflects an ‘confrontational’ strategy or a ‘compromise’ involves some arithmetic. The first two tables provide parameters to value a proposal and the NPV associated to each of them. First, we estimate the value (at current YTM) of the «original» 2010 proposal (a Discount bond exchange) if offered today. 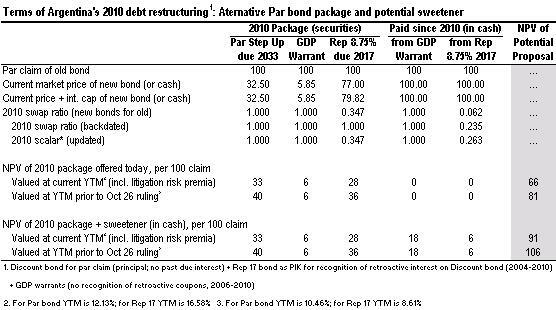 We also value an «alternative» 2010 proposal (a Par bond exchange) and the potential addition of «sweeteners» to either (retroactive payments on GDP warrants and Republic 17s). These valuations are all based on proposals that preserve the critical feature of not recognizing PDI on old bonds of the original 2010 offer. Therefore they represent a major deviation from contractual law interpretation the Court might be expected to embrace. Second, we value these same proposals at (lower) YTM: for instance, at the YTM prevailing prior to the October 26 ruling, which is some 460 to 800 bps lower than today. Why do we emphasize this metric? We use the lower YTM prior to the adverse October 26 Court of Appeals ruling in order to illustrate the potential (higher) value of such packages if markets anticipate that holdouts will embrace the offer. There is no doubt that holdout creditors are aware that this litigation risk premium should disappear if they accept the deal and hence, they should be expected to value Argentina proposal from a perspective of a lower discount factor. 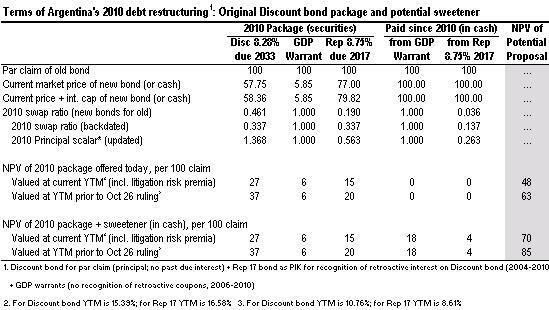 The rationale for tweaking the 2010 deal and alternatively offering a Par bond (as was the case in the 2005 restructuring) is that it provides more favorable optics (relative to a Discount bond) for the Court since it does not involve a principal haircut (while the Discount bond offered in 2010 implies a 66.3% principal haircut). Judges might be attracted to a proposal that leaves face value (FV) intact—and a Par bond option offers a higher NPV recovery to holdouts than does a Discount bond option. 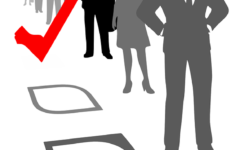 Of course, plaintiffs have an interest in educating the Court regarding the vastly inferior NPV a Par bond package (that only recognized principal claims and not PDI) brings to the table relative to the value of a recognition of full legal claims on record. Indeed, the NPVs of such proposals fall far short of the 334% value of the Court claims held by holdout creditors. At current YTM the NPV ranges from 48-91% of principal (‘eligible claim’). At the YTM prior to October 26 ruling their NPV rises to a range of 63-106% of principal (‘eligible claims’). Therefore, while substantially above the value conventionally associated with Argentina’s 2005 or 2010 proposals these valuations fall short of what holdouts might aspire to collect on their claims after almost a decade of passing up Argentina’s offers and relying on litigating strategies. We consider that all these variations of the 2010 proposal will be viewed by the Court as ‘confrontational’ strategies—rather than a sign of ‘compromise’. Finally, we analyze the value of a simple offer consisting of a Par bond and a Republic 17 (as PIK of retroactive interest on the Par bond) exchanged for full principal and PDI claims as defined in court (estimated at 334%) rather than claims as defined in the 2010 restructuring (in the neighborhood of 100%). Unlike the proposals analyzed before, the theoretical Par bond proposal (recognizing full Court claims) can unambiguously classify as a ‘compromise’ because it yields an NPV of 225-287% of par compared to the 310% par claim. Effectively, it represents an offer of 67-93% relative to the court claims (vastly superior to the aforementioned offers representing 20-34% relative to Court claims). The last two tables summarize the proposals (valuing them alternatively at the current YTM or at the YTM prior to October 26 ruling). The «Ambito proposal» falls in a grey area. If it does not include a Republic 17 in the package then the NPV is 133% in the best case (assuming pre-Oct 26 YTM) and looks like a «confrontational» proposal that would require the Court to deviate significantly from contractual law (cram down) to support it – unlikely in our view. However, if a Republic 17 is included (which the article makes no mention of) then the metrics start to change in a meaningful way. Now the NPV (while nowhere near a simple Par bond package) is potentially worth 179% of par claim in the best scenario (valued at pre Oct 26 YTM). True falls short of 334%. But it exceeds by multiples the value at which holdouts likely purchased the claims (implying a meaningful economic windfall) and also the package that restructured bondholders received in 2005 and 2010 (implying a compromising offer by Kirchner). 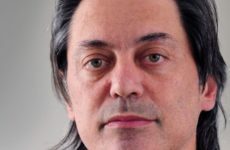 Investors focused on Argentine markets have been forced to second-guess the response of Courts, Argentine politicians, third party intermediaries involved in litigation. To anticipate markets, the time is now coming when it becomes important to assess the potential value the NPV of the March 29 proposal and second-guess the response from holdout creditors.